Poo - means flower. Kalam means special shape. 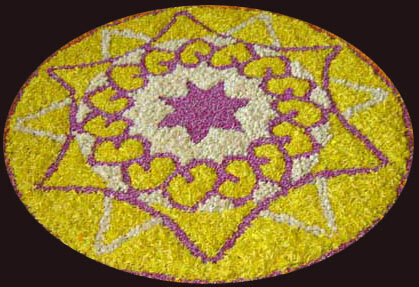 Pookalams (flower mats) are usually circular in shape. Onapookkalam is made of various kinds of flowers. 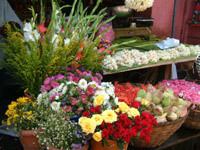 Commonly used flowers include Thumba (Lucas Aspera), Kakka Poovu, Thechipoovu, Mukkutti (little tree plant), Chemparathy (shoe flower), Aripoo or Konginipoo (Lantana), Hanuman Kireedom (Red pagoda plant) and Chethi (Ixora). Of all these flowers, Thumba flowers are given more importance in Pookkalam as they are small in size and glitter in the soft rays of the sun. 'Thumba Poo' is also considered to be the favourite flower of Lord Shiva and King Mahabali was a devout worshipper of Shiva. 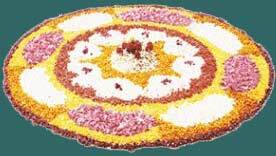 Various societies and business groups all over the state organize Pookalam decoration competitions (Creating abstract patterns with petals, the floral carpet competition) on the day of Onam. Big prizes are also offered in these contests as they have turned up to be extremely competitive events. Recently, people prepare intricate designs first on computer and then implement it on floor. This saves a lot of time and energy and helps the designers to come up with stunning Pookalams. Known otherwise as Puli Kali. 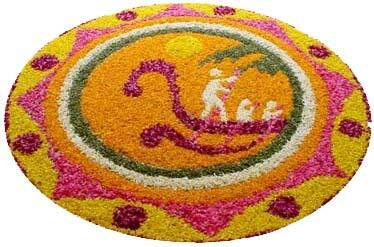 It is a traditional art form of Kerala performed during festive seasons especially during the Onam season. Performers paint their bodies in bright yellow, red and black spots and lines to resemble tigers, and go about from house to house, dancing vigorously to the loud beating of percussion instruments like Chenda, Udukku, Thakal, etc. The fabulous procession of elephants is one of the major highlights of Onam and attracts thousands of people from India and abroad. A golden plate beatifically designed with different size golden babbles called “Nettippattam” is placed on elephant’s forehead which enhance the elephants look more handsome. The long stemmed ceremonial silk and satin umbrellas laced with white metal or silver are placed on top of the animal. Elephants adorned with gold plates on their forehead and umbrellas on top present a majestic sight. A colourful silk robe, some jewelry and body painting adds to the looks. These pachyderm amuses its audience especially children by shaking its trunk and the big body a little along with the rhythm. 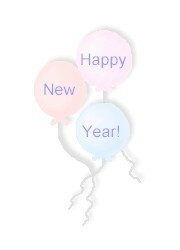 The procession is added with feasting, dance, music and merrymaking. The most impressive and good-looking animal gets the honor of being a part of the procession..